A BUBBLING CAULDRON: Monahan and Banners - Why? Monahan and Banners - Why? WHY DID GARY CARE ABOUT TEMPORARY BANNERS? 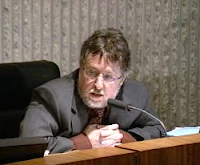 We were just a little curious why Councilman Gary Monahan would bother to bring the issue of temporary signs and banners before his council colleagues last week, particularly since the Planning Commission is going to be tasked with reviewing all our sign ordinances in the very near future. After a little debate the council rejected his suggestion that, in light of the current economic times, the code enforcement folks cut businesses some slack and not enforce the temporary sign and banner section of the municipal code. So, on Monday, the 26th, I took a little cruise past Monahan's pub on Newport Blvd. and guess what I saw? Yep, what looks like a brand, spanking new banner stretching all the way across his Newport Blvd. frontage! Here's the photo, in which you can see three ladders that may have been used to install the banner that very day. The photo was taken shortly after noon. The following information is extracted directly from the municipal code, Title 13, Chapter VIII, Table 13-115, and defines very clearly the restrictions placed on such signs. MAXIMUM AREA 0.5 ft. per unit. Maximum area: 100 sq. ft. per site. 0.5 sq ft. per lineal foot of building of building frontage facing the street. Minimum entitlement: 25 sq. ft. per tenant. Maximum area: 75 sq. ft. per tenant. DEVELOPMENT STANDARDS 1. The entire surface of the banner must be securely affixed to a building wall of the business being advertised (the building wall must abut a public street or on-site parking area serving the business being advertised), or to the sign face of a freestanding sign. 2. May not be attached to any staff, pole, line, framing, vehicle, or similar support. 3. May not project above roof. 4. Must be maintained in good condition; removed or replaced if torn, faded, or dirty. 5. Limit one banner per tenant or building occupant on each street frontage maximum. 6. Banners are permitted only as a means of temporary advertisement, such as for new businesses, grand openings, or similar special events, and may not be used as permanent signs. I draw your attention to items 1 and 2 under Development Standards. Item 1 says, "The entire surface of the banner must be securely affixed to a building wall of the business being advertised (the building wall must abut a public street or on-site parking area serving the business being advertised), or to the sign face of a freestanding sign." Item 2 says, "May not be attached to any staff, pole, line, framing, vehicle or similar support." Looking at Monahan's sign in the photo above, it sure doesn't seem to meet those requirements to me. I didn't take the time to attempt to measure the sign, but if it's 3 feet X 25 feet it would meet the maximum size allowed. So, do you suppose Monahan just decided, "The heck with it! I'm gonna put my sign up anyhow!"? I guess we'll find out when the code enforcement folks pay his gin mill a visit in the near future. Outstanding work, Sir Pot Stirrer. What a coincidence that one week after the council shot down Monahan’s sign proposal that he puts one up. Something tells me that it was already made and waiting. 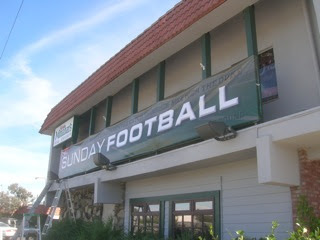 Since the sign says, “Sunday Football” then Monahan will take it down after the season is over, but then will be put another up that says, “NBA Basketball” and so on? The sign sure looks like it is attached to poles as well. Oh, well. I guess Gary feels he is and his signs are above the muni code. Thanks for your work on this story. I look forward to the updates. did I tip you off to that first?? ?